Renewing the park in North Wharf, one of eight new parks we’re creating for Melbourne by 2020. The City of Melbourne is working in partnership the Victorian Government, developer Riverlee and landscape architects Oculus to create a new park at Seafarers Rest in Docklands. This is one of eight new parks we’re creating for Melbourne by 2020. Seafarers Rest is an existing public open space earmarked for renewal in the City of Melbourne’s Open Space Strategy. 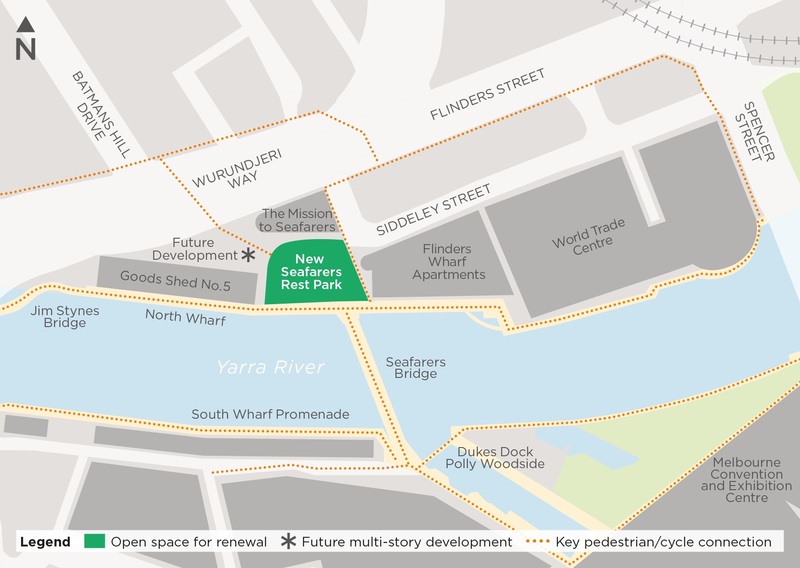 It has also been identified as a key area in the Docklands Public Realm Plan. A larger project to build a new 17-level mixed use development and restore the neighbouring wharf shed and crane is also underway near the park. We are working with our partners to shape a concept for the new park, and recently ask the community for their feedback to help guide the design brief. Seafarers Rest Park is located between the Mission to Seafarers heritage building and the Seafarers Bridge. Come along to the Docklands Community Forum and learn more about Seafarers Rest Park, and have your say. Who is creating the new park? Seafarers Rest is an existing public open space earmarked for renewal. The City of Melbourne is working in partnership with the Victorian Government (Department of Treasury and Finance) and private property developer Riverlee to create a new park at Seafarers Rest in Docklands. Seafarers Rest is located on the north bank of the Yarra River between The Mission to Seafarers heritage building and the Seafarers Bridge. What is currently happening at the site? Wharf and crane restoration works in the area have required the site to be mostly fenced off. This fencing is anticipated to be removed in the coming months with the reactivation of the site and the temporary installation of a sales office. The neighbouring multi-story development is anticipated to commence construction mid-2019 and the park renewal is expected to commence construction in mid-2020. What will the park look like? We are currently collecting information to determine what the park will look like in the future. This information includes current site conditions, identifying opportunities and constraints and community input. We are seeking community input to inform the park’s design brief. The design brief currently being prepared by the City of Melbourne will guide and shape a concept for the new park. When will a park concept be completed? With your input, a draft concept plan will be developed in 2019 for further community feedback. Share your ideas for the new park at Docklands by 14 December via the feedback form.